ze: 18pt;">Pycnogenol® is one of the most trusted, researched, and versatile dietary supplements. Patented. 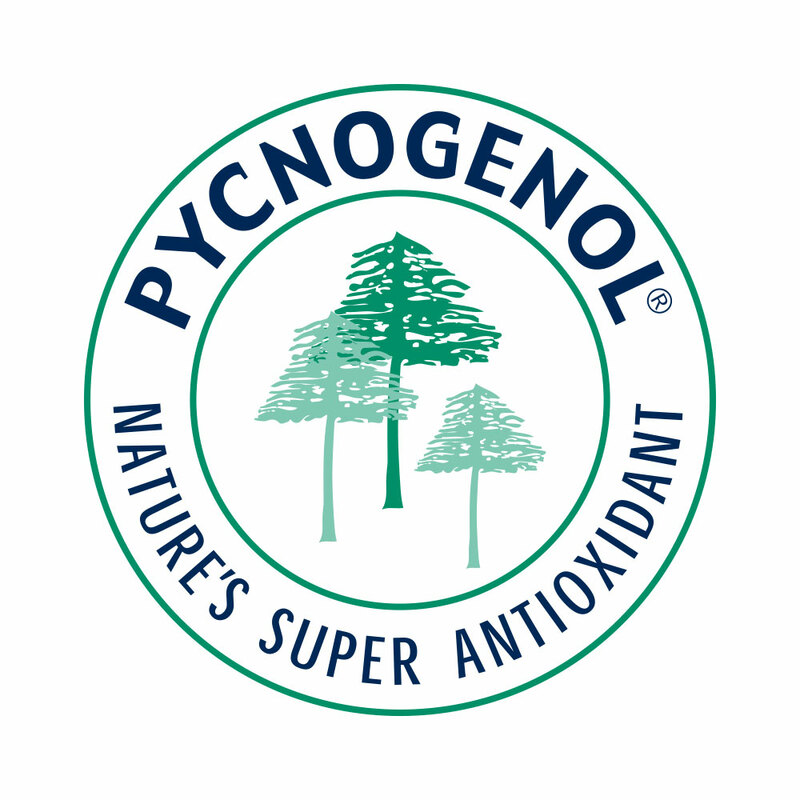 Pycnogenol is the only pine bark extract patented to support overall health by combating oxidative stress. Clinically Researched. Pycnogenol is one of the most studied branded supplements with over 400 research papers. Established. Pycnogenol has been produced and researched for over 40 years. Pycnogenol is a patented, clinically-studied extract from the bark of the French maritime pine tree produced by Horphag Research. Similar to standard pine bark extracts, the main active ingredients in Pycnogenol are procyanidins (also called proanthocyanidins), bioflavonoids, and phenolic acids. 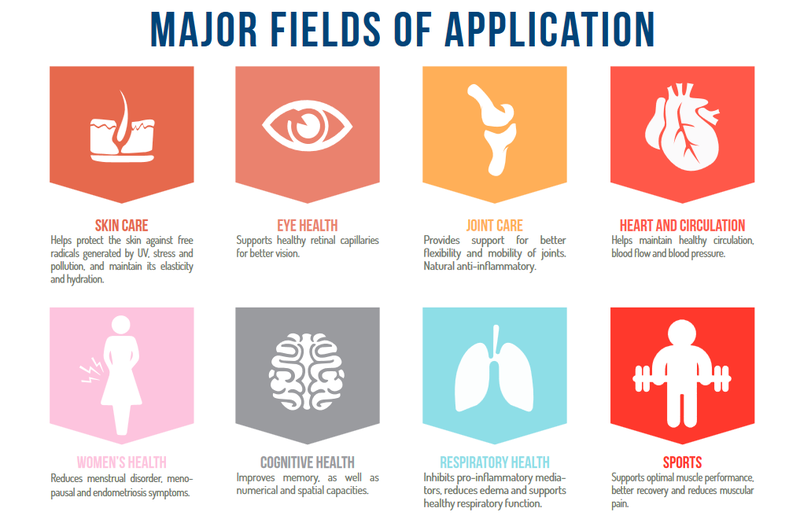 Because of these effects, Pycnogenol is advertised to support overall health and help with various chronic health disorders, and is currently included in more than 700 different supplements, cosmetics, and health products. Pycnogenol’s uses include protection of eye health, alleviation of diabetes, arthritis, erectile dysfunction, venous and circulatory disorders, improvement of exercise performance, skin care, and more. Pycnogenol was first envisioned in the 1960s by Charles Haimoff – the founder of Horphag Research – as a supplement for supporting healthy aging. 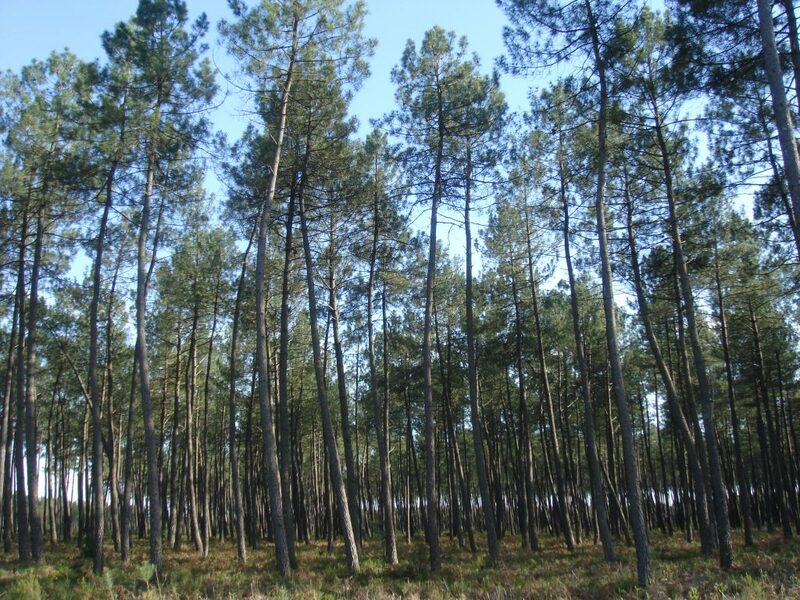 Unspoiled forest of French maritime pine trees used to produce Pycnogenol. 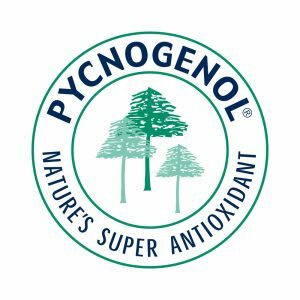 Pycnogenol was first patented in 1987 as an extract of maritime pine (Pinus pinaster) bark meant to alleviate the negative effects of oxidative stress, such as poor blood flow, inflammation, collagen degradation, and more (US patent 4698360). 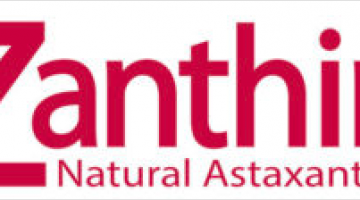 Its main active ingredients are proanthocyadins, which make up 65-75% of the extract. This patent includes an extraction technique where 100 kg of pine bark is first made into a powder which is then extracted to create 250 L of liquid then is then cooled, filtered, and extracted several more times until 1 kg of powder containing 65%-75% of proanthocyadins – the main active ingredient – is left. Pycnogenol is also patented for helping with erectile dysfunction in men, especially in combination with arginine, an amino acid known to promote blood flow. According to this patent, the proanthocyanidins present in Pycnogenol stimulate eNOS, an enzyme which in turn acts on arginine to promote the production of nitric oxide (NO) – a compound that widens blood vessels, which can improve erectile function (US patent 6565851). Under this patent, Pycnogenol is combined with Gotu kola to help with atherosclerosis – the build up of plaque on artery walls (US patent 20120164244). Pycnogenol is used in a wide range of health products. In addition to being sold by itself as a single-ingredient supplement purported to support antioxidant defenses, joint health, and blood circulation, Pycnogenol is included in various multi-ingredient products. Pycnogenol’s ability to enhance blood flow has made it a popular addition to pre-workout formulas. Enhanced blood flow is believed to improve performance, as showcased by studies reporting increased exercise endurance following Pycnogenol supplementation. In addition to its use as a performance enhancer, Pycnogenol is also utilized in post-workout supplements because increased blood flow may also help with recovery. In particular, several studies have reported that Pycnogenol supplementation helps reduce muscle pain and cramps after working out. Studies have shown that Pycnogenol helps alleviate arthritis, prompting its increasing use in joint health supplements. In particular, research suggests that Pycnogenol inhibits the inflammation central to arthritis by suppressing NF-kB, the major pro-inflammatory pathway in the human body. Pycnogenol is commonly added to nootropic formulas because clinical research has shown that it enhances cognition and memory in particular in both young and older adults, and has also been shown to help with ADHD in children. Pycnogenol is proposed to aid the brain by enhancing blood flow through increased nitric oxide (NO) levels. More on Pycnogenol’s nootropic benefits. Pycnogenol has been demonstrated to benefit health in a multitude of ways, including cardiovascular health, exercise performance & recovery, diabetes, cognition, and arthritis. This double-blind, placebo-controlled, randomized study examined the efficacy of Pycnogenol in type 2 diabetes. A total of 77 participants were given placebo or Pycnogenol (100 mg) daily for 12 weeks. The Pycnogenol group experienced a reduction in HbA1(c) levels – a measure of blood glucose concentrations – and improved endothelial function, an important element of cardiovascular health. The efficacy of Pycnogenol for osteoarthritis (OA) was examined in this double-blind, placebo-controlled, randomized study. A total of 100 people with knee OA were given placebo or Pycnogenol (150 mg) daily for 3 months, while continuing to use nonsteroidal anti-inflammatory drug (NSAIDs). The Pycnogenol group improved on the WOMAC index, a measure of osteoarthritis pain, stiffness, and physical function, and also reported reductions in pain and NSAID use. This double-blind, placebo-controlled, randomized study examined the efficacy of Pycnogenol in Attention Deficit/Hyperactivity Disorder (ADHD). A total of 61 children were given placebo or Pycnogenol (1 mg per kg of body weight) daily for 4 weeks. The supplemented group experienced a reduction in hyperactivity, improved attention, and visual-motor coordination and concentration. This double-blind, placebo-controlled study examined Pycnogenol’s (PYC) effects on cognition and overall health in older adults (60-85 years). A total of 101 elderly participants were given Pycnogenol (150 mg) or placebo daily for 3 months. The Pycnogenol group experienced improvements in working memory and lipid peroxidation, a measure of oxidative stress. 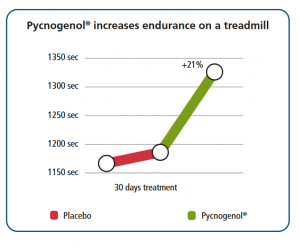 The effects of Pycnogenol on cardiovascular health were examined in a double-blind, placebo-controlled, randomized study. A total of 23 people with coronary artery disease (CAD) were given Pycnogenol (200 mg) or placebo daily for 8 weeks in addition to standard medication; they switched groups and repeated the experiment 2 weeks later. 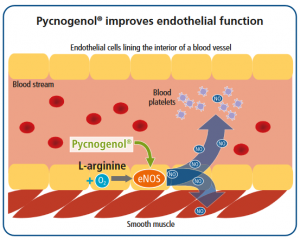 Pycnogenol supplementation improved endothelial function and oxidative stress. 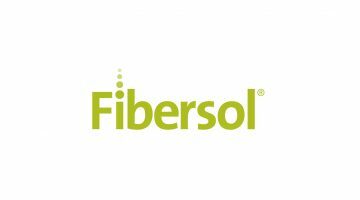 The goal of this double-blind, placebo-controlled, randomized study was to examine the effects of Prelox®, a formulation of Pycnogenol and l-arginine, on erectile dysfunction (ED). A total of 124 men (aged 30-50) were given Prelox or placebo tablets daily for 6 months. 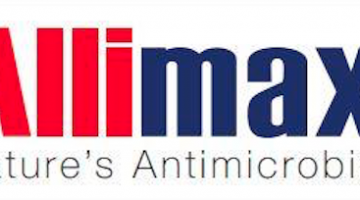 By the end of the study, the Prelox group improved on the International Index Of Erectile Function (IIEF) and in testosterone levels (15.9 nmol/L to 18.9 nmol/L). 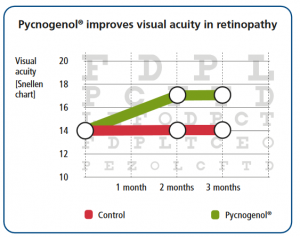 This double-blind, placebo-controlled, randomized study examined the efficacy of Pycnogenol in retinopathy – one of the leading causes of deteriorating vision. Twenty people with retinopathy were given placebo or Pycnogenol (150 mg) daily for 2 months, while another 20 were given the same Pycnogenol dose in a separate experiment. 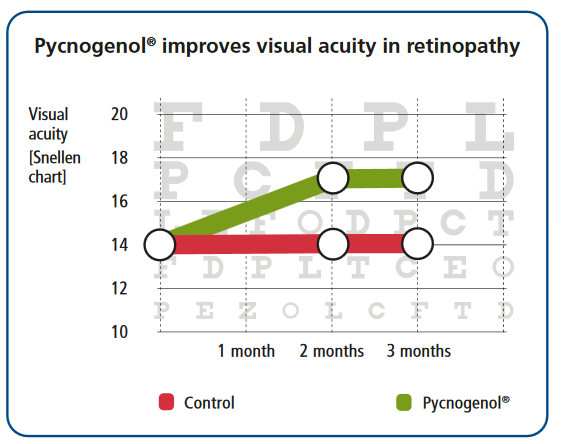 Whereas the placebo group’s retinopathy and vision got progressively worse, the Pycnogenol patients’ retinopathy remained stable and vision improved. This double-blind, placebo-controlled, randomized study looked at Pycnogenol’s effects on chronic venous insufficiency (CVI), a condition where veins in the legs have difficulty sending blood back up to the heart. A total of 40 people with CVI were given placebo or Pycnogenol (300 mg) daily for 2 months. The supplemented group experienced reduction or complete disappearance of edema (swelling), heaviness, and pain in the legs. Pycnogenol is one of the highest quality supplement ingredients available. 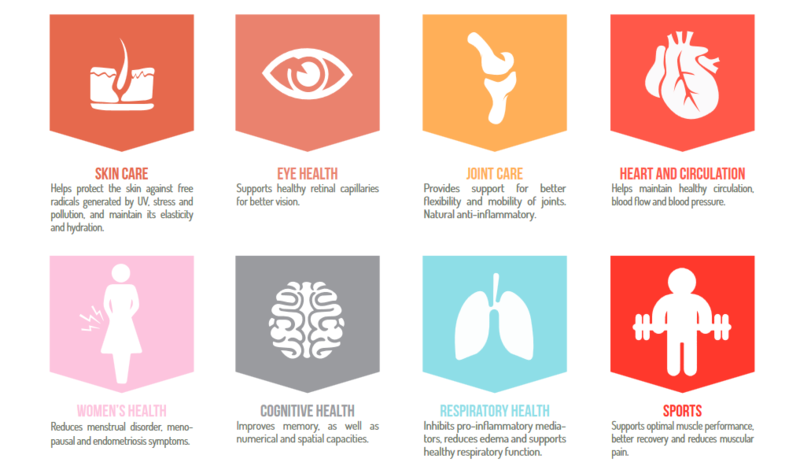 Unlike most supplements – branded or unbranded – Pycnogenol is backed by over four decades of research, and has shown an impressively wide range of health benefits. The ideal dose depends on your needs. Pycnogenol is used for many different reasons, all of which will dictate different dosages. For general health needs however, 150 mg daily is the recommended dose.